Field Files | Williamson Williamson Inc.
Field Files is based on new possibilities afforded by the use of CNC technologies. There are two cabinetry types. They are both conceived as monolithic objects –like butcher blocks that are carved out of massive pieces of stacked plywood. Traditional distinctions between functional and symbolic elements – tops, fronts, hardware, structure, and surface are eliminated in lieu of a smoothed and singular strategy; all aspects of the design are accounted for through the act of routing into the depth of the wood. 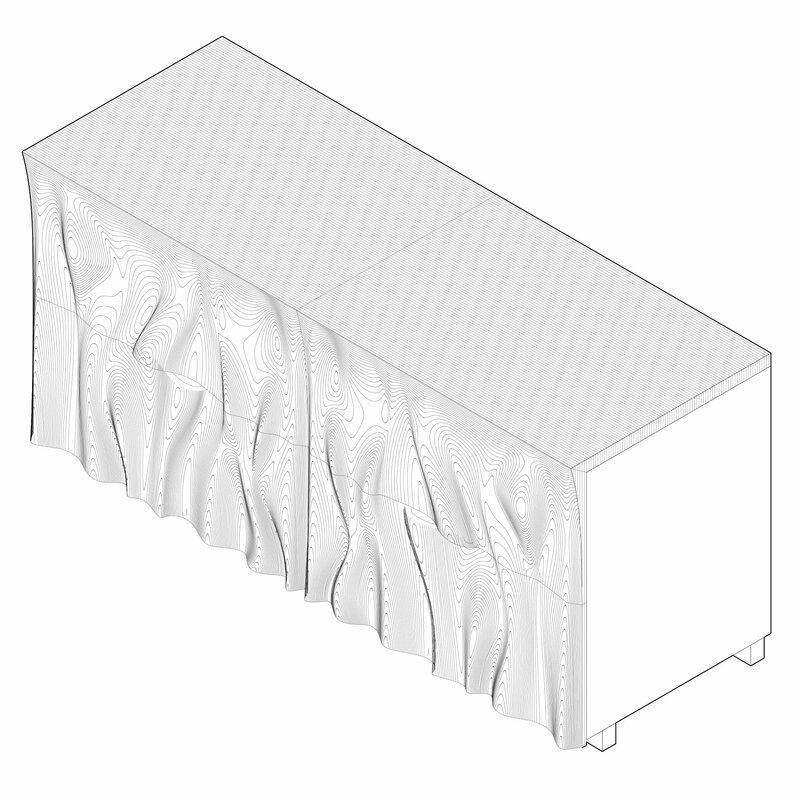 Both pieces of cabinetry are designed to accommodate repetition as well as variation, an option easily afforded as a result of digital fabrication. 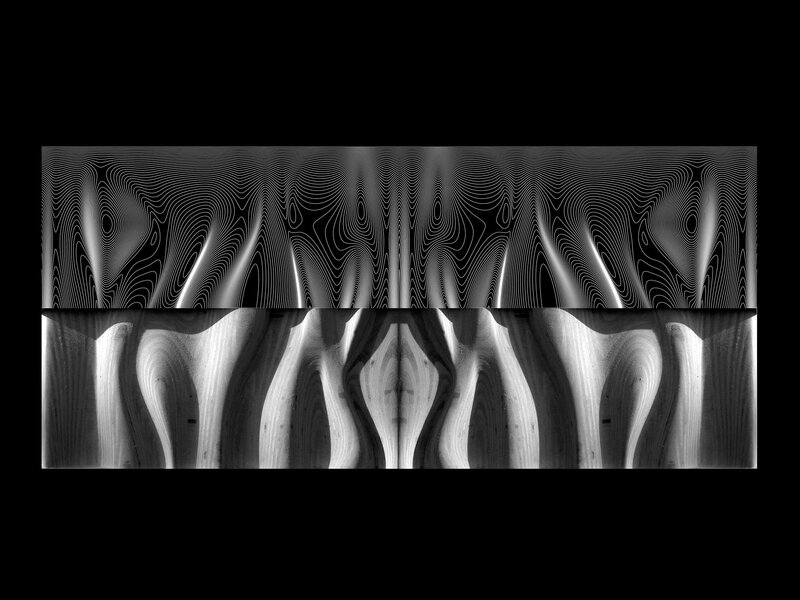 So too, each piece capitalizes upon three-axis milling techniques to produce artificial and invented graining as a result of the striations latent within laminated plywood constructions. The first cabinet is composed of a stacked laminate counter top whose lines run parallel to the cabinetry front. 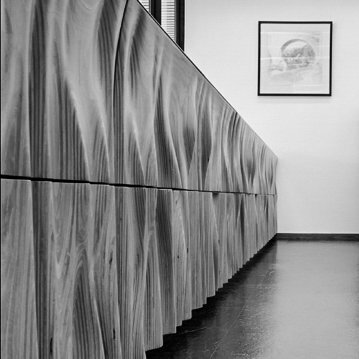 Consistent with the top, the cabinetry front laminates appear as extensions of the end-grain. The front is routed out in a fashion to create a smooth transition from the counter top extending the end-grain down the cabinetry front ”” turning the corner, as it were. The routed front is subjected to various undulations that perform in a variety of ways. Their depth is maximized in the center so that two pulls are created for the opening of the drawers’ fronts. They are recessed and compressed at the edges to create a reveal when two cabinetry fronts are put side by side. 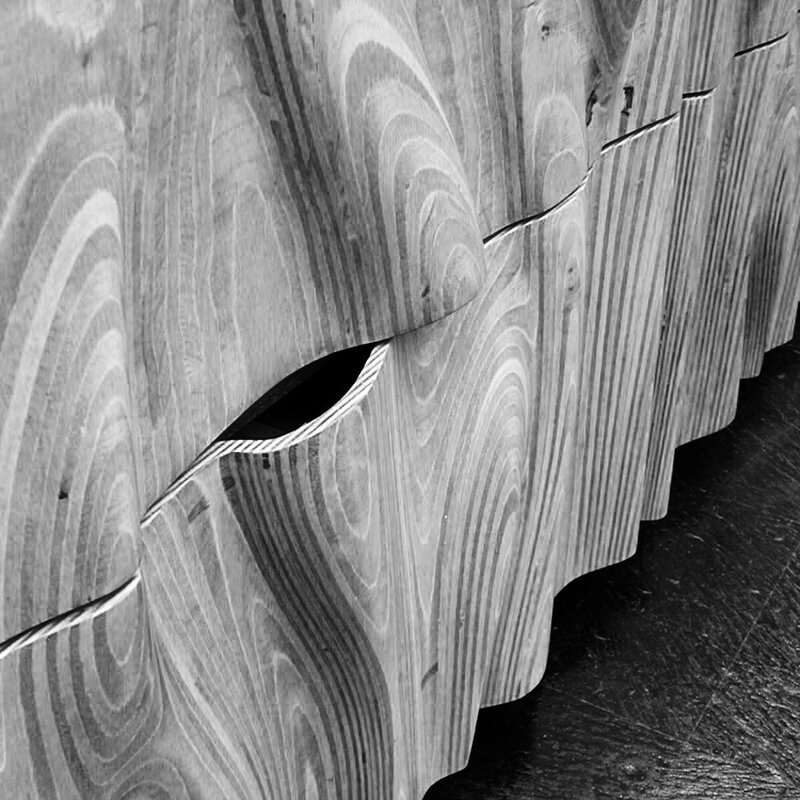 The profile of the bottom is also left to undulate as if draped like a piece of fabric, countering the static and monolithic image of the stacked wood piece. The second cabinetry type is composed of stacked plywood that runs perpendicular to the cabinetry fronts. The end-grain turns the corner and descends the fronts in a continuous fashion so as to enhance the monolithic nature of the piece. 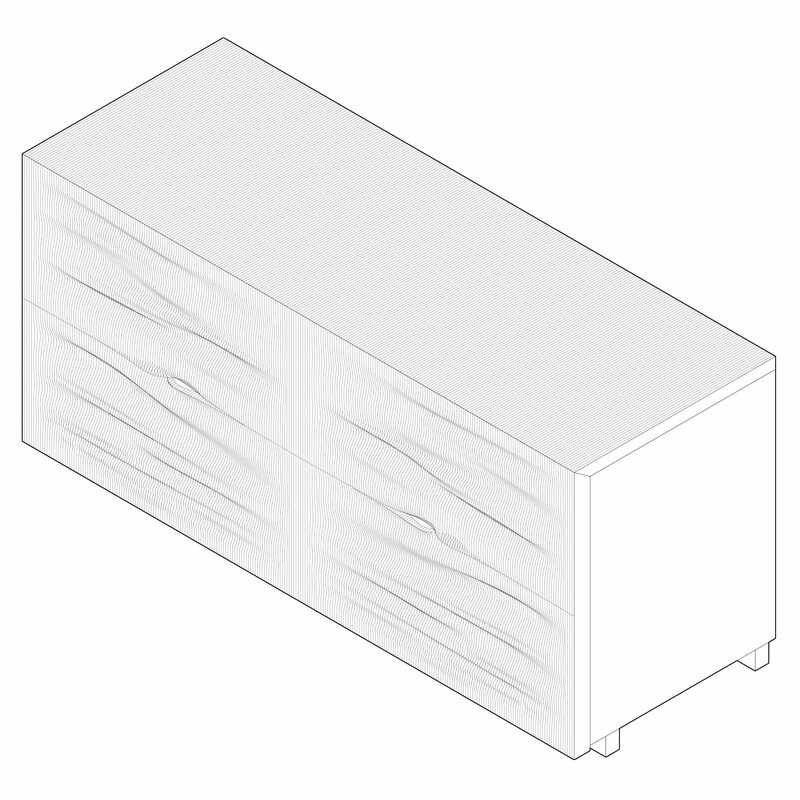 Similar to the other cabinet type, the front acquires undulations that enable the design of cabinetry pulls at the seam between the top and bottom drawers. The undulations are flattened at the edges to enable flush connections between two adjoining cabinet fronts. 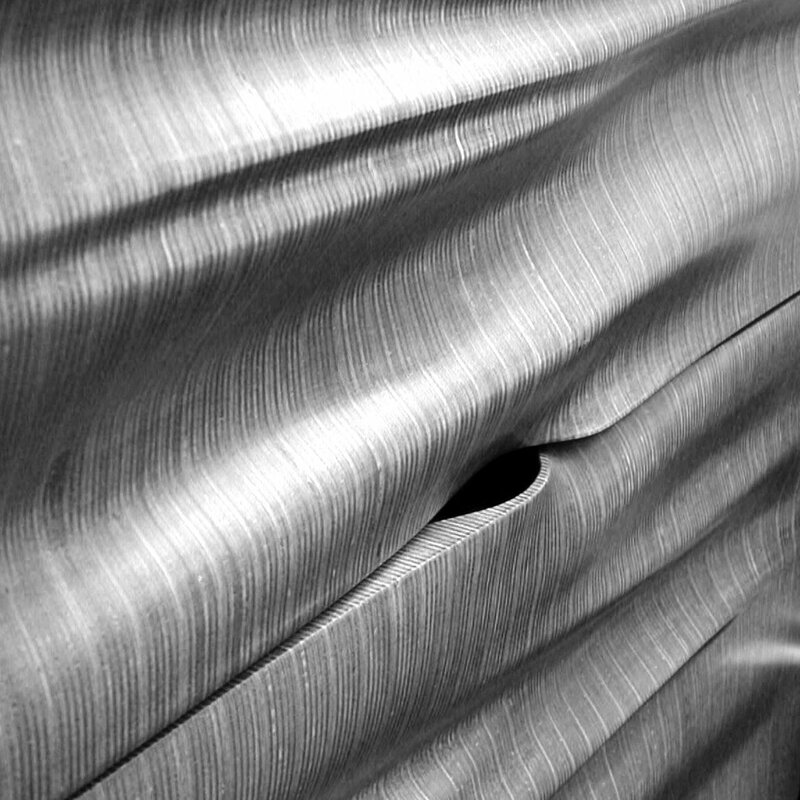 The resulting appearance acquires a paradoxical reading as the solid nature of the wood block confronts the taut and fluid nature of the fabric-like surface. Field Files is based on new possibilities afforded by the use of CNC technologies. There are two cabinetry types. 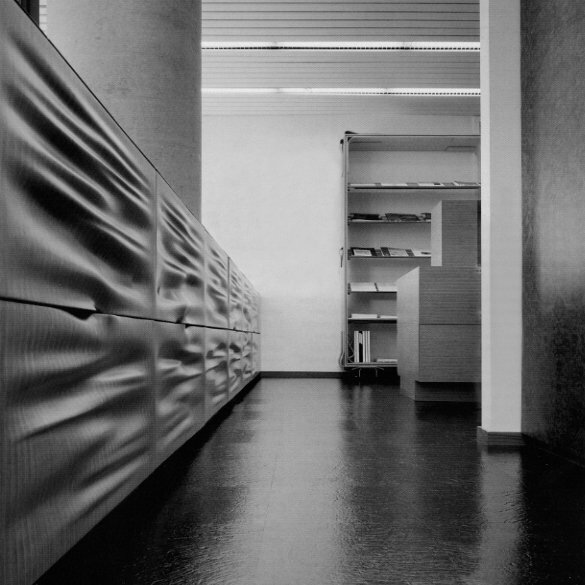 They are both conceived as monolithic objects capitalizing upon three-axis milling techniques to produce artificial and invented graining as a result of the striations latent within laminated plywood constructions.